500 Down, 1700 to go. It was several years ago—probably about six years ago—that Hazen Dempster (aka “Gadget”) commented to me that he wanted to hike all of the Appalachian Trail in Georgia. That comment lodged in my brain, and bounced around for a while. As my 55th birthday approached, wanting some kind of a challenge to take on in light of that “milestone” (hey, I rode 100 miles on my bike on my 50th birthday, so I needed to do something around 55), I decided to try and thru-hike the Georgia section of the Trail. Look back to entries from 2012 to see how that turned out—not so good. I eventually was able to finish the Georgia section, and once that was done, thought, “Why not North Carolina?” I chewed off the first 20 or so miles on my own, invoking the wrath of Gadget, so we set a week to finish North Carolina—which we did in 2013. For the record, we were neither lost, nor from the mountains, nor were or are we boys, but it seemed to fit. Along the way, I’d managed to nibble away about another 50 miles from a gap that we created when we jumped ahead in 2015. Yes, I felt the ire of the rest of the gang, so this year we decided to tackle the gap we had between the northern border of the Smokies and Indian Grave Gap outside Erwin, TN. It was a challenging itinerary, forcing us to take on average about 15 miles per day over some fairly challenging terrain. The first day called for a 19-mile day; we told ourselves we’d done days that far and long before, and since we’d arranged for the first eight miles to be essentially a day hike (carrying very little), we thought we could handle it. The climb out of Erwin Tennessee was more than a challenge; it was a killer. Add the heat of the time to the mix, and we were withering by lunchtime, spreading out along the trail. As evening started moving in, we realized we would not make out planned stop for the night—we pulled up about three miles short and camped. Telling ourselves we’d make the miles up the next day, we were later breaking camp than we wanted, and difficult climb followed by treacherous descent followed by tough climbs and equally hard descents wore us down. Sawmill strained a knee, and it became obvious we were not making the planned stop for the night. Fortunately, we’d met a brother and sister who offered to give us a ride into Hot Springs, NC if needed, and we took them up on it. We regrouped, taking a zero day in town, admitting that our planned itinerary was too ambitious given our (ahem) advanced ages and fitness levels, and the heat and dry conditions (water was really scarce at points) worked against us, as well. Sawmill got a rental car and drove home, the remainders were shuttled to where we’d pulled out on Sunday, and started hiking. When we reached the spot we’d planned to spend Sunday night, we realized we would have all made it in the dark, if we’d ever gotten there. We plodded on, meeting and chatting with South-bound through-hikers, and making the best time we could. It was hot, climbs were difficult, I won’t mention the times we walked off-trail or thought we had, but I will mention the fact that more and more people told us about the scarcity of water. We managed. Fifteen miles north of Hot Springs, NC, Pippin pulled out, to be able to get home to sick babies, and prepare for his grandfather’s funeral, and to try and let his ankle that he had rolled too many times to heal. He had covered the trail into Hot Springs before, so it was not a problem. The dregs of us pushed on, for the better part of that Thursday, camped near the top of Rich Mountain, and made our way into Hot Springs in time for lunch on Friday. Tired, sweaty, footsore, bedraggled, and no doubt smelly, I had closed a gap, and Gadget was about 35 miles away from having closed one. As we sit outside Bluff Mountain Outfitters, we have hiked close to 510 miles of the AT together. Only another 1700 to go. At this stage of the game, we’ll be about 77 when we finish the Trail! You get to know a guy fairly well when you walk 500 miles with him. I can’t think of another hiking partner I could trust more! “Chuck, I need to see you in my office,” Coach Davidson said as he turned and headed toward his office. I was a Junior in college, and an equipment manager for the football team at Arkansas State University. As I recall, it was a Tuesday in a week before an out-of-town trip. Depending on the trip, we would more often than not fly in for the game, and fly back immediately afterwards. Sometimes we would fly in Friday, but this particular week was a same-day trip. I started following Coach D to his office, my mind racing, trying to keep from freaking out, wondering how I had messed up and how much trouble I was in. “You haven’t done anything,” he said. I started to freak out a little bit more; “Coach, what did I not do?” I was envisioning being kicked off the team, my scholarship going away, and trying to figure out how to pay for school. “It’s nothing you have done, or not done, but it directly involves you,” he said. We got to his office, and he settled in behind his desk. I was relieved that I was not instructed to close the door. On the one hand, I was incredibly relieved, because this clarified that I was in fact NOT in trouble, and that my position on the team, my scholarship, and everything else was intact. On the other hand, however, I knew this created some problems. “Yessir,” I said, and headed back to continue getting ready for that day’s practice. Johnny and I must have talked about how he was going to handle things that weekend without help. We got everything loaded, then closed the baggage compartment. The team filed onto the jet (Southern Airways charter), and I talked to the guys as they did so. The local ABC affiliate, KAIT-TV always flew with us, and one of their crew told me as he was boarding that a car was coming from the station brining a camera. He asked if I’d keep an eye out for it, and bring them the camera when it arrived. The flight was ready to take off, sitting on the tarmac waiting for the camera. I stood there on the tarmac near the terminal, freezing to death. Hands shoved in the pockets of my jeans, my cotton-lined nylon team jacket snapped as high as I could snap it and still be “cool,” shoulders hunched to try and pull body heat in, I stood there, waiting for the camera. I heard a car approach, and looked to see that it was from the TV station. They pulled up, and I ran over as someone got out with the camera. “They need this on the plane,” he said. Someone in the back of the plane signaled to me, so I hustled as best I could down the tight aisle, and shoved it in the overhead rack, then turned around to get off the jet. Only to see Coach D standing there, blocking my way. “Chuck, sit down,” he said. “Coach, I’m not supposed to travel this weekend. I need to get off,” I said, still trying to juke my way to get around him and get off. “CHUCK,” he forcefully barked, “sit down right there, we need to take off and you’re holding us up.” He pointed at a seat. The forward doors closed, and we started to taxi to the runway to take off. I sat there confused, trying to figure out what had just happened. I learned that it took over the flight, with everyone begging Coach D to let me travel that day; so when I came on with the camera, he sat me down (boy, did he ever!) and I made the trip. Looking back, I have no idea where we went, who we played that night, even whether we won or lost the game (I think we were 6-5 that year). But I do know this; when I realized the entire team was asking me to be allowed to travel with the team, I knew that I was the big winner. Doc Thompson was one of the remarkable characters I was privileged to know when I was serving First Presbyterian Church of Pascagoula, MS. He was a retired dentist, who after his wife’s early and untimely death, managed to keep his dental practice going while raising their six children. Pretty amazing man, astoundingly impressive family. By the time I became his Pastor and we met and began to know one another, Doc was well into retirement, and living alone in his home. The realities of life started catching up with him (he was deaf as a doorpost, but that’s a story for another day), and he had cancer. With a loving family and a crack medical community who all loved him very much, Doc got the best of care. But sometimes even the best of care can’t beat cancer, and he was fighting a losing battle. At one daughter’s request, I had the “How’s your soul” visit with him one day, and he shared with me that he loved the home he was going to, but he wasn’t quite ready to go there just yet. I think it was the day before Easter, and Doc was in the hospital (had been for a while), and I went to visit him that Saturday morning. As I walked towards his room, I saw two adult children outside in the hallway. “I don’t think I’d go in there right now if I were you,” his son Leslie said. “Pop’s getting a sponge bath. Too bad he’s out of it, I think he’d enjoy it,” Leslie laughed. After a bit, I wandered back to Doc’s room. I knocked on the door, hearing voices inside, heard the “Come in” invitation, and walked in to see Tricia on the door side of the bed leaning over her Dad, trying to get him to respond to her. Leslie was on the other side of the bed, Libby was standing at the foot. He opened his eyes, and looked at me intently. Then he looked at Tricia and Leslie, then back at me. He looked at me as I said that, then he bellowed—BELLOWED—loud enough to be heard ‘round the world; “I KNOW WHO YOU ARE!!! YOU’RE MY PASTOR! AND YOU’RE FIRED!! YOU HEAR ME, BOY? F-I-R-E-D! (he spelled the word out) PUT ME THROUGH ALL THIS (I need to redact the word he used at this point, as it is not approved for young readers, but it began with an S)!!!!! Then Doc serenely closed his eyes, and relaxed, and was asleep, or out of it, or something. Stunned at the energy behind his voice, I looked across the bed to see Tricia trying not to laugh out loud, as Leslie and Libby smothered their own laughter. “Well, we heard that,” Tricia laughed. I laughed it off—I really did—and headed on home. I don’t remember the remainder of the day, but I remember what happened as we ate dinner at my house that night. We’ve always had the rule that we did not answer the phone during a family meal (no TV, either), but this night, as we were eating and the phone rang, sensitive to Doc’s condition, I asked Lib to get the phone when it rang. I’d not told her about Doc firing me, you see. When I answered the phone, Perry said, “Pop may have fired you, but the rest of us are going to keep you,” he laughed. I chuckled (pardon the pun), and he assured me that there was nothing to worry about. Turns out he’d fired his Doctor a day or so earlier, but that, as my firing, changed nothing. We both stayed on the job. It was a week later that Doc was promoted to the Church Triumphant, but that—and a few other Doc stories—will be for another day. My name is Joseph ben-Tachsheet. For generations, my family has been in the jewelry business, travelling around the world finding, buying and selling rare gems and stones. We have seen diamonds, rubies, emeralds, sapphires, in settings that would dazzle you and leave you speechless. Personally, my greatest finds have been in Persia, where I have managed to acquire some of what I remain convinced are some of the jewels left from the kingdom of Solomon, the great King of the Hebrew people. Once Jerusalem was plundered, and the Temple treasures looted, jewels scattered all over Persia. Finding them, convincing the owners to show them to me, and then bartering with them over endless cups of tea until we settled on a price that was acceptable to neither of us, yet agreed upon by both of us, sometimes took days. As much as I loved owning these gems, I must confess that my greatest delight lay in the back-and-forth of the relationship that resulted in the jewels changing hands. I have made friends (and, I suppose, enemies) all over the land through my business dealings. Even Egypt proved to be a challenge. That great nation, now supplanted by Greece and the Rome, still held great treasures; many looted from tombs, they still were incredibly valuable. The danger in locating the so-called “owners” of some of these gems was life-threatening at times, but still the exultation I felt in the chase was enough to lead me to risk it all. 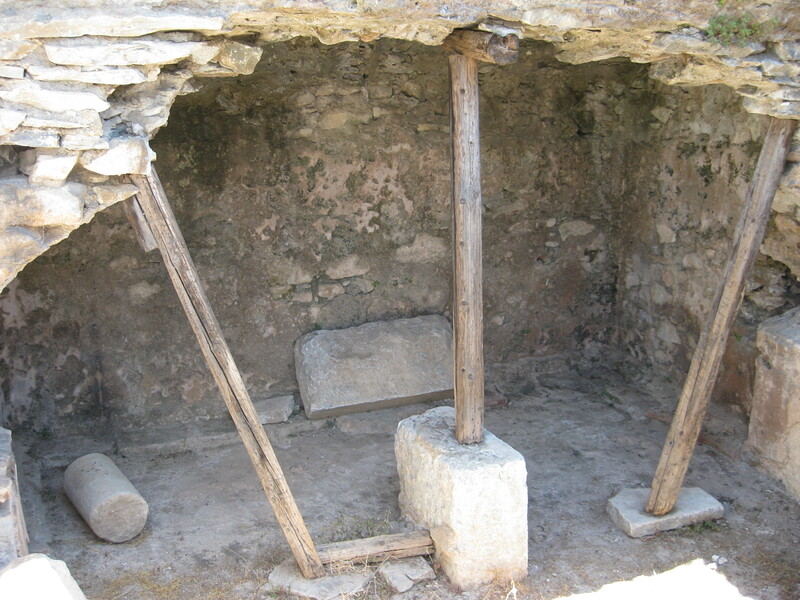 My family’s home, for many years, lay in Sepphoris, a small village not far from Nazareth. While we travelled far and wide, we always returned to this comfortable, familiar town. Business could be traded there, and with stone-cutters making good wages in the town, we were able to sell to them for fair prices. All seemed right, until troops of Roman soldiers came to town demanding we return to our family’s historic birthplace to register for a census. As word travelled through the community and I realized what a business opportunity this would be, my frustration turned to thrill as I envisioned myself working the crowds along the roads and in towns and cities selling and perhaps buying more jewels. Because my family traces its roots back to Jesse, the father of King David, it was determined that I would travel to Bethlehem. My journey took me longer than it could, because I would take additional time in villages, or spend an extra day in the caravan bartering with men travelling with their families. I had arrived in Bethlehem, and found distant relatives with whom I could stay, who extended gracious hospitality to me when I suggested I may leave a stone or two with them when I departed, as long as I could stay longer than needed. With one of their three daughters betrothed, I think my cousin saw my business and offer as a great benefit. On some days I would travel to Jerusalem, just a few miles away, and ply my trade with the crowds there. Other days I would simply sit near the gate of Bethlehem and share stories with the people coming there to register. My cousin’s home, as simple as it was, sat upon the crest of a hill; some evenings I would climb to the roof of the house and look across the valley where I could see the top of the Temple. Every time I went to Jerusalem I would try to visit this holy site and connect with our God. One evening as I was about to come down, I saw a man leading a donkey, on which sat a poor girl who seemed to be so terribly uncomfortably pregnant that she looked as if she would deliver her baby that very moment. The man led her to the hoe of my cousin; I listened as my cousin suggested other homes, but the man and girl had tried them all. They desperately needed a room for the night, but as my cousin explained, their humble home was overfull. After being admonished by his wife, my cousin said there was room in the cave carved out beneath the home, where they kept their animals at night. It was settled; the man led the moaning girl around to the side of the house, and into the cave. I showed a few more stones to the family that night before finally retiring. I looked all of my jewels over before rolling them up in a cloth and placing them in the bed with me. Thinking about the opportunities I may find on the road back to Sepphoris, I nodded off to sleep. Somewhere in the night, I was awakened by a piercing cry; someone was in great pain, letting the world know this! A few moment later, I heard another cry similar to the first; something, I do not know what, urged me from my bed, and outside. I heard yet another cry, but this one different—it was smaller, less painful, almost like that of a child. Trying to understand what it may be, I hear voices—muffled, but excited—from the side of the house. I wandered around in the darkness, until I saw light coming from the cave that was serving as my cousin’s stable. What I saw there made the cries I heard make sense. It was the young girl’s labor that awakened me. And her baby’s cries that I heard next. The poor girl lay on a bed of hay, looking thoroughly spent, but holding her tiny baby as if it were the most valuable treasure in the world. The father stood there, looking confused and lost, wanting to help but not knowing what to do. He kept mumbling that this was his son, but he was not the father. What made no sense at all were the shepherds who arrived about the same time, overcoming my revulsion with their scent with their tale of angels appearing and telling them about the birth of this baby. I stood just inside the cave trying to understand what was happening, when the girl looked at me and gestured for me to step closer. I did, then knelt down to see her baby as she turned him toward me. His red-splotched face all scrunched up like an olive left in the sun—as traumatized by birth, also showed something else. I couldn’t understand it, until he yawned and barely opened one eye as if he were looking at me. That’s when it happened. In that slit of an eye, as unfocused as it was, I realized I was gazing at the greatest treasure I could ever find. This little baby was a pearl of great price, worth all of the precious stones I had in my room. I never went back to my room, I never collected my gems and gold. I stayed the rest of that night with the little family, and when they left the next day, I left with them. I did what I could to help out, to take care of them, and whatever I could to be near that child. We journeyed to Egypt some time later with the help of gold that some wise men from the east gave the family. Then we returned later to Nazareth, where I joined the baby’s father in his carpenter’s shop. And I watched that boy grow into a man, and tell everyone about the love of God. I never questioned my choice to give everything up for him that night, especially the day I saw him give his life for me. I gave him my life that clear night; maybe you have heard of him; his father named him Jesus. When I lived in Pascagoula, MS, and served the First Presbyterian Church as their Pastor, I was privileged to get to know, and be friends with, a number of Navy officers who served on ships that were based at the Naval Station in Pascagoula. There is a shipyard in Pascagoula which builds ships for the Navy, and I suppose that is what justified the base that has since been closed. One of the remarkable joys of the privilege I had was getting to be close friends with several of the Captains for the ships based there, and as a result, having access and entrée to the ships. I even was asked to participate in a change of command ceremony one year. One day I was on the USS Ticonderoga, which happens to be the first Aegis-class ship that was built. I don’t recall the particulars of the visit, but I do remember that I was reading about leadership and change theory at the time. As I walked the ship that day, I asked the Captain how long it would take him to turn the ship around if he was moving at maximum speed. “Thirty seconds,” came the immediate reply, with a smile. I thought about what I had been reading about leadership and change theory, and how to lead change in the life of a church and congregation. A lot of change, fast, creates a lot of mess, and it takes a long time to clean up and establish trust. Contrast that with another story about the Tico. My family had been invited to go on a “Friends and Family Cruise,” when the Navy allows the ship to leave port for a half day cruise with civilians on board. They let family and friends of the sailors see the ship, what it is like, what it takes to operate, etc. Fun and games are planned for the kids, everyone gets a meal on board, and it generally builds good will for everyone. This particular day there was a complication. There was a tropical depression in the Gulf of Mexico that was whipping the water up enough that the ship could not go out. We got a phone call advising us of this, but telling us that we should come on out, that everything was going to be done on board the ship, simply docked at the base. And then I learned that while we were all on board the Tico, the ship had moved away from the dock, into the Mississippi Sound, turned around, and re-docked. And I never knew the ship had even moved. A complete and total change, and I never knew it. There are two things in life I have learned that are constant, always present. One is change—it’s always going to be a part of life. Sometimes the change that comes into my life is sudden, disruptive, and messy—like the unexpected news of my father’s death in 2003—and takes a long time to clean up. Sometimes the change is slow and unnoticed, like the pine tree in the corner of our yard that was just a few feet tall when we moved into our home in 2005, and now is tall and strong. Change is always going to be present. And so is Jesus. A thousand years ago (well, to be more precise, it was 35 or 36 years ago) I was in a conversation with a classmate in Seminary. We were in our second or third (of three) years, and while I can’t clearly recall what led into the conversation, I do have a very accurate recollection of a snippet of the dialogue. John was a second-career student (that means that he had been out of school, and worked in the “real world” for a while, and was now in Seminary. I asked him what he had done before Seminary, and he shared that he worked for NASA. Curious if not fascinated, I asked him what he did, and he said that he studied the effects of weightlessness on muscle tissue. At this stage of the game I was a mid-twenties young man, in fairly good shape (as I am today—I tell people that “round is a shape!”), active, fit, and exercising regularly, running quite a lot at the time. As such, I was very interested in what NASA had learned, so I asked him. That advice, if that’s what it was, has stuck with me for a long time. I had arthroscopic knee surgery in 1993, and within a month of the surgery, I was back at the YMCA working out. A friend asked which knee I’d had surgery on, and when I said it was the left one, he said, “That’s what I thought; your left calf is smaller than the right one.” In other words, the calf muscles had atrophied, because they had not been used as much. Mark had some X-rays shot, then he came in and talked to me. OK, he asked a lot of questions and listened to me, then manipulated the knee some. He said he could feel some inflammation in it, then looked back at the X-rays. “I don’t see any narrowing of the joint as I expected,” he said (Mark performed arthroscopic surgery on this knee in about 2009.) “And I don’t see any arthritis in it.” I asked if he wouldn’t need an MRI to see that, and learned then that arthritis shows up in an X-ray better than in an MRI. You know, it’s not just my body that this applies to—or yours, for that matter. It is my soul, and yours, as well. This is why I get up at 4:30 five days a week, and darn early the other days of the week. I don’t want my soul to atrophy, either. When I was a boy, we spent a month each summer in an old farmhouse in New Hampshire. The house was 150 years old when it first came into our family’s hands and had never been modernized. As my father was the minister of a modest-sized Episcopal church, we were always short of money, and so for a long time we lived in the house quite simply, without the benefit of modern plumbing or electricity. Our water supply during these years was an old well that stood just outside the front door. The water from this well was unusually cold and pure and a joy to drink, and the well was remarkable because it never ran dry. Even in the severest summer droughts, when other families would be forced to resort to the lake for their drinking water, our old well faithfully yielded up its cool, clear water. Eventually the day came when the family fortunes improved, and it was decided to modernize the house. Electricity now replaced the old kerosene lamps; an electric stove took over from the ancient kerosene burner; and modern plumbing and running water were installed. This necessitated a modern well, and accordingly a deep artesian well was drilled a few hundred feet from the house. No longer needed, the old well near the front door was sealed over to be kept in reserve should an occasion arise when for some reason the artesian well would not suffice. So things stood for several years until one day, moved by curiosity and old loyalties, I determined to uncover the old well to inspect its condition. As I removed the cover, I fully expected to see the same dark, cool, moist depths I had known so well as a boy. But I was due for a shock, for the well was bone dry. It took many inquiries on our part to understand what had happened. A well of this kind is fed by hundreds of tiny underground rivulets along which seeps a constant supply of water. As water is drawn from the well, more water moves into it along the rivulets, keeping these tiny apertures clear and open. But when such a well is not used and the water is not regularly drawn, the tiny rivulets close up. Our well, which had run without failing for so many years, was dry not because there was no water but because it had not been used. The human soul is like this well. What happened to the old well can also happen to our souls if the living water of God does not flow into us. So step away from your tablet, get out from behind your desk, get off the sofa, and get some exercise. Then get on your knees, and exercise your soul. Use it, or lose it, folks. Not too sure how long it has been since I actually sat down and put fingers to keys and felt as if I had something to add to the global blogosphere; but I decided it was time. This little tale begins on Christmas Eve 2016 (with a glance back to August 2015), and jumps into 2017 pretty quickly. First the glance to August 2015; I can’t believe it, looking back, and discovering that I did not blog this, but on August 22, 2015, our daughter Anne became Mrs. Ryan Brody. Anne and Ryan repeated their vows at Church in the Pines on the shore of Lake Martin, AL–the place where I have been privileged to preach for about 20 years, and only 3 miles from the family Lake House. It was a glorious day, the day every family dreams of, and every detail was absolutely perfect. I delighted in the privilege of walking my daughter down the aisle, and the service was begun by Dan McCall, my first boss out of Seminary, and the pastor who baptized Anne. After I “gave her away,” I stepped around and officiated the remainder of the ceremony. While the outdoor service (Alabama in August?!) was a bit steamy, the reception was indoors where the AC was set to blizzard. We danced, dined, and partied until the newlyweds departed for Atlanta and then their honeymoon. We returned to the Lake House, where a bunch (BUNCH) of friends were coming to hang out, have a beer, and catch up. On returning to the house, I was a bit distressed to not be able to locate Gumbo, our almost-15 year old black lab. Long story short, I found him a bit later; he had “expired,” and gone to that place where there are no fences, no cats, and the rabbits are all fat and slow. We buried him there, and took solace in our daughter’s joy in marriage. We pretty well decided that our dog days were behind us. Lib was tired of sweeping up hair, and I didn’t think I had another dog burial in me. So life moved on. I arrived home a bit before 10:00 PM, having been in or observed what felt like 100 worship services (in actuality it was only eight); I was exhausted, and as I pulled in the driveway I watched Lib run through the kitchen, and wondered, “What’s that all about?” I parked in the garage, walked in, and did not see her. I made it to the den, calling her name, and nothing. I walked upstairs, tossed my suit coat on the bed, and turned to see her step into the opening to the sunroom off our bedroom, as a puppy trotted out of our bathroom into the sun room. This little wiggle worm (see her tail moving too fast to be photographed?!) has brought so much joy into our lives, “It takes two to tell it” (as my mother in law would say.) We have spoiled her rotten, trained her pretty well (she’s easily the smartest dog I have ever had), and she has spoiled us. And she has taught me about the love of God. In the mornings, I get up at an unthinkable hour (4:30) to have my quiet time and exercise before the day begins. I let Scout out to “do her business,” then she goes to my office where I have my devotions. I’ve put a bed down there, and she has a couple of toys, and a chew or two. But what she wants is to be in my lap (even at 35 pounds now! ), licking my face, begging for attention. And I find myself wondering, “Why do I not hunger for God’s attention the way this little girl hungers for mine? !” She has inspired me, and taught me that simple affection-pure, unbridled joy-is what God wants from us, as much as Scout gives it to me. She is unquestionable an instrument of sanctification in my life. And wow, do I (we!) love her!!! Wow. So much that we have seen, and how in the world to sum it up in just a few paragraphs? The last day that we spent in Istanbul was a really busy one; we started the day walking to a museum devoted to ancient mosaics, where grand mosaics that have been discovered by archaeologists—most found in homes or courtyards—have been painstakingly excavated and moved, so that people can see and appreciate them. From there we walked to the Carpet Museum, where we viewed ancient—and I mean ANCIENT—carpets on display in atmospherically controlled environments. From there it was Hagia Sophia (Holy Wisdom), the church built by Emperor Justinian in 537, that was converted to a mosque after the Crusades (conversion of a church to a mosque involves facing Mecca and saying a prayer from inside the church, then adding some architectural accoutrements that are required for a mosque), which is now a museum. The artwork within it is fascinating, the architecture that went into building it is historically groundbreaking, and the grandeur of the space—even with the scaffolding inside used in current restoration—is stunning. 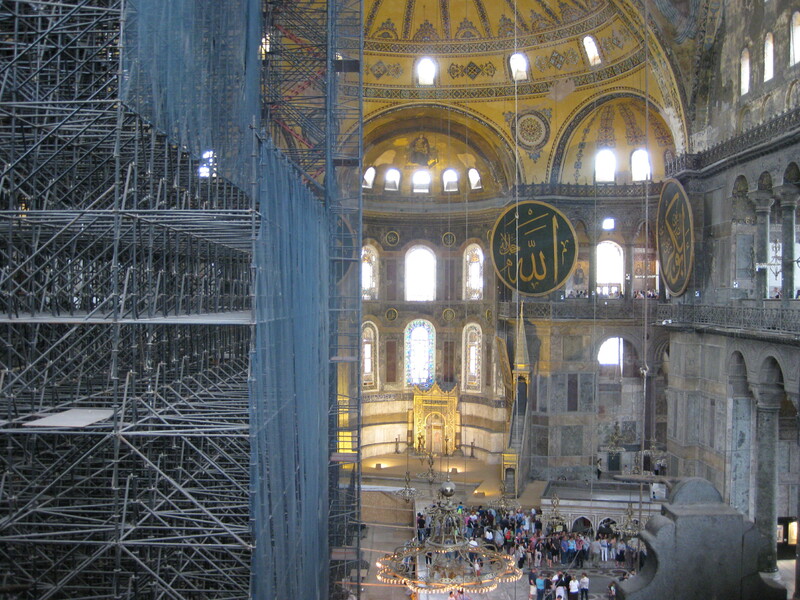 Interestingly, at the top of the main dome, there is a painting or fresco depicting Jesus, which was covered entirely with a painting of the first verse of the Koran; but allegedly in the ongoing restoration, plans are being made to uncover and reveal the painting of Jesus. The next day we drove—a LONG way—to view the ruins of ancient Troy, and ponder the truth of Homer’s depiction of the Trojan War (he wrote about it around 5-800 years after the war, basing his story on oral traditions); the archaeological discoveries are jaw-dropping, with some speculation that there may have been a Hittite city on the site that predated Troy by hundreds of years. But the evidence of roads, and homes, and temples, and theater, are plain to see. After a night in Canakkale, we traveled to the ruins of the ancient city of Assos, visited by the Apostle Paul on one of his journeys (but no mention of his staying there any amount of time), then on to the site of Pergamum, where one of the churches mentioned in the letters to the seven churches in Revelation was. To read and remember that the message to that church mentioned the “temple of Satan,” and to see the many temples in the area—to Athena, to Trajan, to Dionysius, to Zeus—helps one to reflect on the fact that the hope of the Christian faith struggled in a culture that was oppositional to the message of the Gospel. We today, in lands and cultures where the Gospel is unknown (even in America! ), and where other faiths are more prominent, need to remember that we must always speak the truth—and in love! The magical port city of Kusadasi was our next stop, allowing us to make a trip to the sprawling, ancient city of Ephesus. 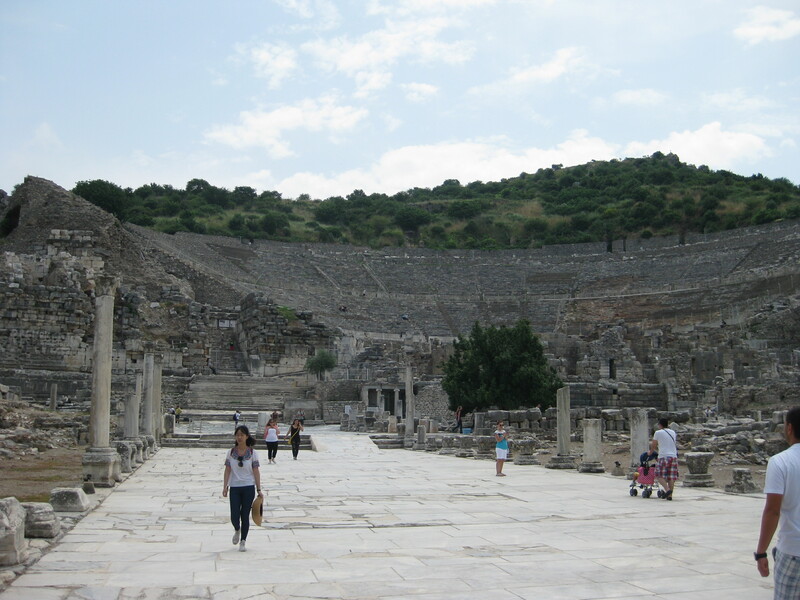 Ephesus was an important port city in its time, was where Paul’s preaching and the conversion of many to the Christian faith prompted an economic crisis in the city that resulted in a riot that led Paul to need to “hot foot it out of town.” The Apostle John allegedly ended his ministry and life here, as did Mary, the mother of Jesus. There is a tiny church on the alleged site of Mary’s home, as well as the ruins of an ancient Basilica above the purported site of John’s tomb. But the archaeological site of Ephesus is simply amazing—it spreads far and wide, with evidences of Greek and Roman influence, but here and there, the sign of the Cross can be found. To think that both Paul and John came here to spread the good news of Jesus; and that a church started here to which Paul later wrote one of his letters—is an encouragement to all followers of Jesus to continue to be bold witnesses wherever we go, and whatever we do. Lib and I ended the day with a few others at a carpet school, where we were privileged to see how hand-woven Turkish carpets are made; how silk is collected from cocoons and spun into thread; and were later treated to an explanation and display of probably 50 rugs. And despite the soft-sell, great price, and wonderful attention, we walked away without purchasing one! Next up? The cruise of a few Greek Isles, with the Isle of Patmos, where John received and wrote the Revelation, on the first day! 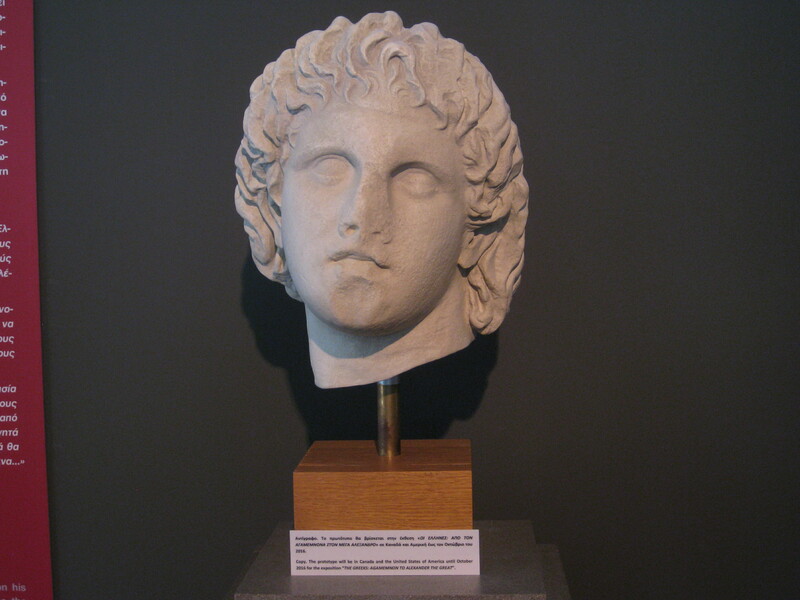 Tuesday we travelled from Thessalonica, again reversing the course taken by the Apostle Paul, making our way through Amphipolis to Philippi, the first city on the European continent where someone was converted to the Christian faith (see Acts 16), and where Paul and Silas were arrested and beaten, then jailed, before being miraculously released from their jail (picture is purported to be the location, while history and archaeology suggest otherwise—but it WAS somewhere in the area) and using the incident to proclaim the faith and lead more people to Jesus. Wednesday was a day spent on busses. We left Kavala headed for the border with Turkey, grieving that we would say goodbye to our guide Maria and driver Nikos (we’ll see Maria again, and we hope Nikos.) We arrived at the border around 11:30, and since the bus could not cross (long story, let’s just say that the Greeks and Turks don’t get along too well), we were met by two taxis that arrangements had been previously made to shuttle us across the border. We loaded (overloaded!) the two taxis with bags, filled the cabs, and sent the first crew across the border. It took almost an hour before we heard (via call) that they had made it, but the bud and guide on the Turkish side were not there. 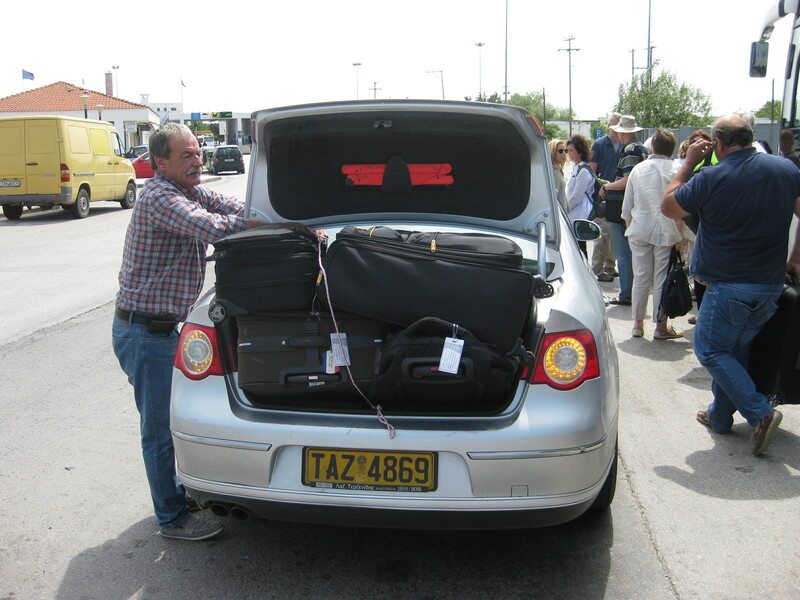 . . the taxi’s returned, we loaded more bags, and this time crammed five passengers in each cab. Passport went fine, customs went OK, until one car was pulled over, and held up. The car I was in zipped on through, and we waited (the bus and guide now having arrived) and waited and waited. It turns out that the taxi was emptied (of bags and people), and the auto itself was X-rayed. The same thing happened (to the same car!) on the first shuttle. But finally we were all through, and on the bus with Tosun (guide) and Mahmoud (driver). We drove for a bit, stopped for a bite to eat, and proceeded on to Istanbul. I must say that crossing the border offered a stark contrast. The terrain is markedly different in Turkey (no more mountains); the country is much more populous, there is a great deal more traffic, gas prices are about double, and the country just feels . . . heavier. With a population that is 99% Muslim (by birth, not by practice), there are as many mosques in cities as there are churches in America, but we are told that fewer and fewer people practice the faith. Today was a really busy day; after breakfast we visited the Blue Mosque, which while still a functioning mosque, is a major tourist attraction (hundreds and hundreds of people lining up to view it and take pictures). Not only is it beautiful inside with its paintings and mosaics, it is also an architectural masterpiece, with the majestic dome flanked by four semi-domes. From there we viewed the Hippodrome (used for chariot races) with its three obelisks, the oldest dating from 390 AD. Then it was on to the Topkapi Palace, the place from which 30 of the sultans ruled the country; the focus of this compound seemed to be courtyards more than buildings, although there were many of the latter. The treasures room, with an 86 carat diamond once given to a sultan as a gift, was pretty impressive, I must admit. 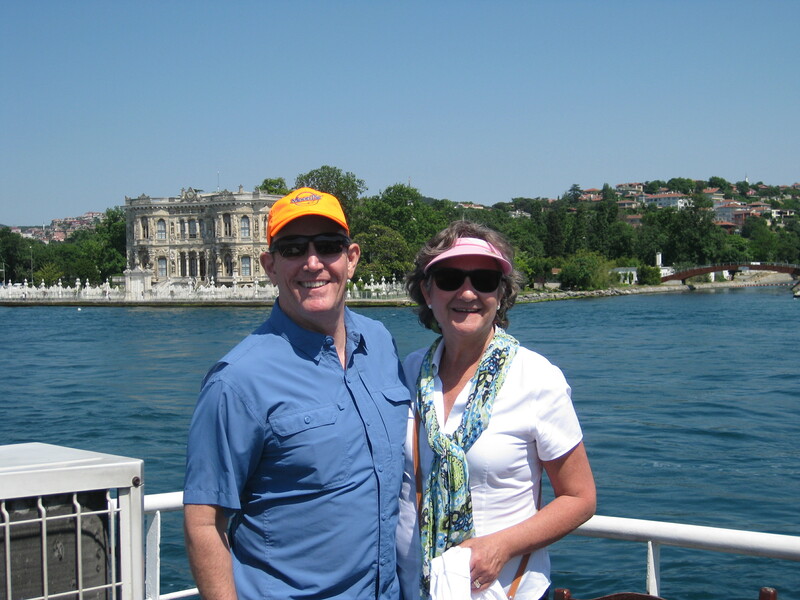 After lunch we enjoyed a private boat tour of the Bosporus Straight, where our guide pointed out many municipal and educational buildings, as well as many, many, mosques. 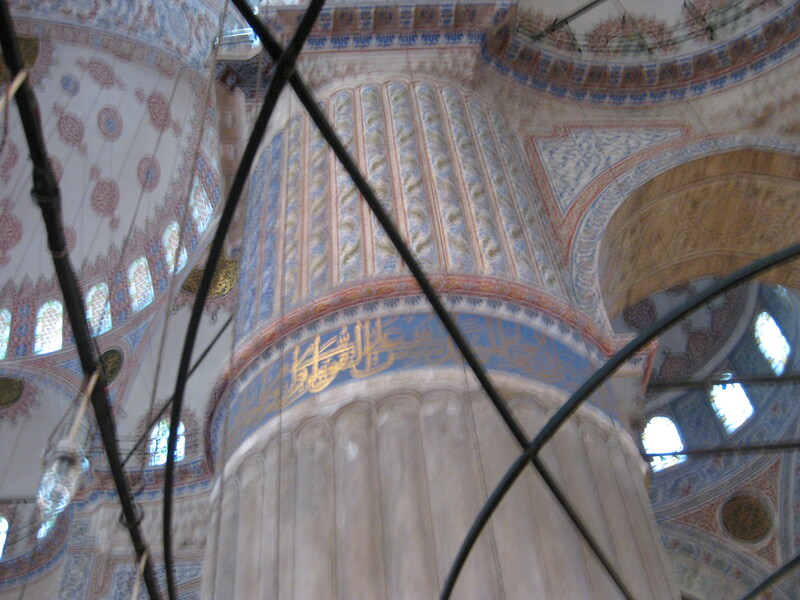 More tomorrow—especially the tour of Hagia Sophia, the Byzantine Church that became a mosque that is now a museum. How does one sum up thousands of years of history in a few paragraphs? After sleeping on the reality of Delphi and the concept of people traveling great distances to make sacrifices and offerings to ask the Oracle the ONE question you can ask, and to walk away with a vague answer, we rolled out the next morning for more history. First we made a quick, unplanned, side trip to Thermopyle, the historic site of the real battle of the Spartan army against the power of the Persian Empire led by Xerxes. Of all the movies made in or about Greek history, 300 is the only one the Greek people appreciate and feel that tells the story with authenticity (in other words, forget Alexander and Troy). 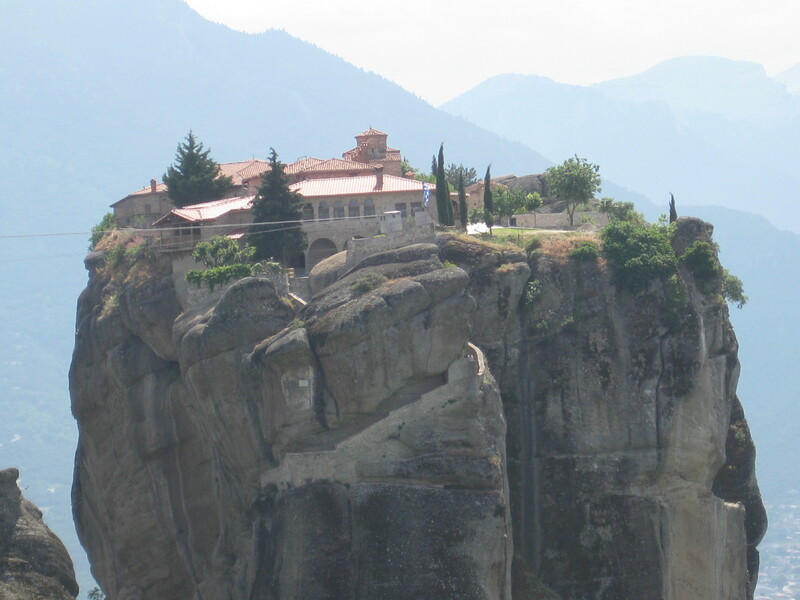 We viewed the site, took a few pictures, then moved on to the city of Kalambaka, where after lunch, we visited Meteora. 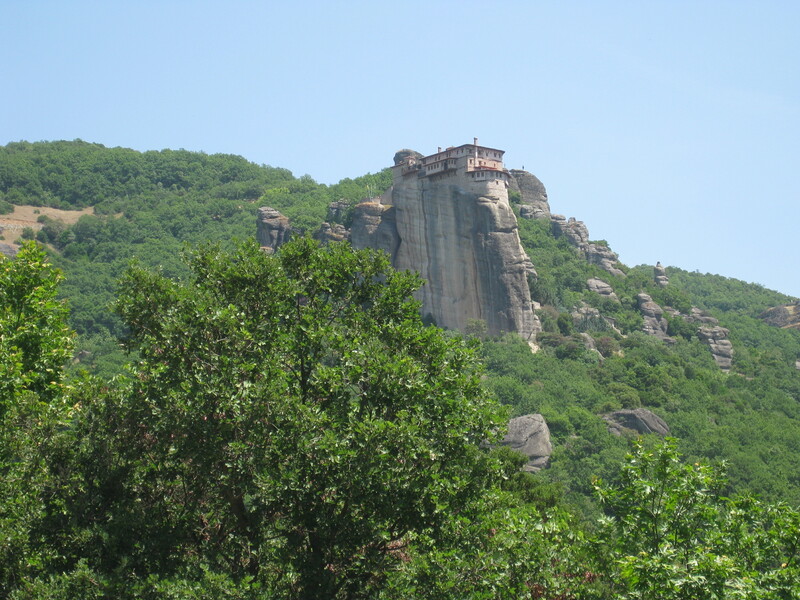 Meterora is this incredible geological formation, where there have been (at one time) twenty four different monasteries; today, there are six still functioning, but the monks and nuns who live in them and find their calling in them, are dwindling. We visited two of them, the Church of St Barbara, named for a woman who was beheaded by her own (Roman) father when he learned that she had converted to Christianity—it is an ancient Orthodox Church that is maintained by a tiny group of nuns. (I have dim memory of it, and will have to check it out when back home), before stopping at the Monastery and Church of St Stephen—another Orthodox Church, this one maintained by monks. The Church itself is relatively new, having been rebuilt after bombings during World War Two. Monday we drove a short way before getting on the Via Egnatia, the interstate highway that functionally follows the old Roman Via Egnatia, the road built through the Roman Empire. Rome either managed the road such that there were already established cities, or they created cities about every 45-60 kilometers, basically the distance a Roman Legion could travel in one day. 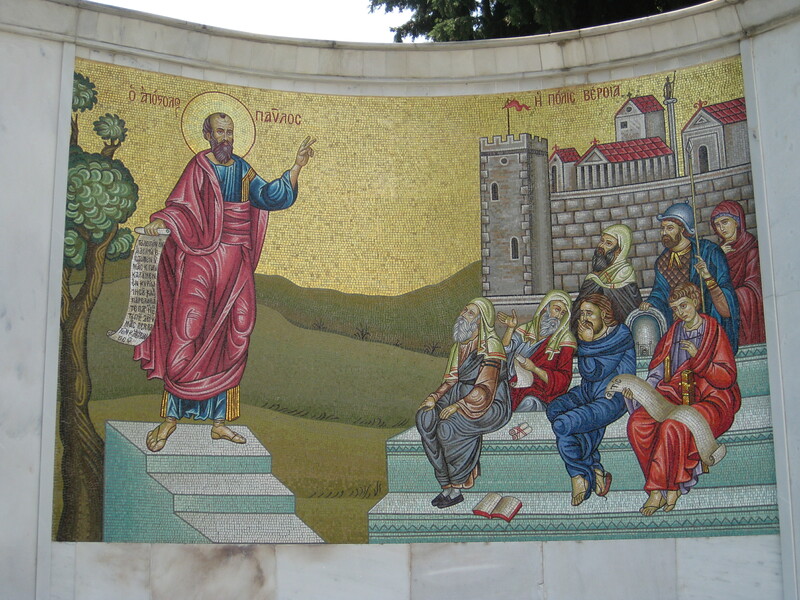 We stopped in Veria, which in the days of the Apostle Paul was called Berea (see Acts 17), and where there is a monument depicting Paul’s work in that city, with beautiful murals. While there, our great guide Maria told us a long, rambling story about a Torah scroll dating to 200 BC, on which rabbis had kept historical notes about the community (there was a strong Jewish community in Berea.) In the marginal notes was information about Paul having come there and preaching. But the Torah was stolen by the Nazis in WWII, found in Auschwitz, then moved to Austria, then Hungary, and is now held by a private collector in Canada, who refuses access to it. Philippi tomorrow, where there are ruins of the old city, and sites surrounding Paul’s work there!